Two days ago in New Mexico I arrowed my fourth bull of the season from 63 yards just after he stood from his high desert bed and headed over to check a nearby cow. I’d been hunkered down, slightly up the hill from him and his 40-50 cows for an hour, before he gave me the chance I needed. I capitalized. The big 6×6 made it 100 yards before dying in a quick 10 seconds. Tonight, I was at the gym, lifting, in an effort to improve as a mountain hunting athlete. Sometimes, I feel like I am climbing a ladder and never quite reaching the top. Or, am I at the top now? Could it get better than tagging four mature bulls on four western bow hunts with every intense second captured for Team Elk TV? Maybe not, but as a hunter obsessively dedicated to improving, there are things I need to shore up. One thing I will never do is rest on my laurels. I’ve heard that, “Once you think you’re where you want to be, you’re not there anymore.” I get that. While I am happy with my success this season and grateful every arrow I released in 2011 found its mark, I know I am far from the perfect bowhunter. I told myself after having my best season ever in the pursuit I love so much, 10 for 10 in 2011, including those four bulls, I was going to take a break. I’d earned a break I reasoned. The night I killed that bull in New Mexico I relished in the thought of relaxing, living the easy life for a few weeks after a month solid of pressure-packed mountain hunting in front of the camera. A good night’s sleep later and all I could think about was how I can increase my skill set? On the way to the airport that next morning I talked guide Eric Kern into taking me to Montosa Mountain so I could try and break the record to the 9,000+ foot summit. It hurt but I got it and that plane ride home seemed just a little sweeter because of my effort. I simply can’t let a day go by that I don’t “put it work” for bowhunting. I know for a fact, I can get stronger, faster, tougher, more accurate with my bow, more confident, become a better leader and improve my ability to influence the growth of the hunting pastime I love so much….that is my true goal. Tagging big bulls is a by-product of this goal. A season like this has me reflecting on my journey. I remember killing my first bull with a bow back in 1989 like it was yesterday. It was my first season as being a bowhunter and I hunted 18 straight days for that spike bull elk in the mountains of western Oregon. In the midst of that nearly three week elk hunting gauntlet, I was close to bulls, made a bad shot to miss a monster bull, passed on close shots I didn’t have the confidence to make, thought that maybe I should just lower my “bull or nothing standards” and shoot a cow elk (which was legal), but mostly I wondered, “How in the heck am I ever going to kill anything with this bow?” For days and days on end success on a bull elk seemed impossible. I was so obsessed with tagging a bull with my bow I didn’t go to any college classes, missing the first two full weeks, until I arrowed that bull towards the middle of September. If I hadn’t had got him, I would have missed an entire month with no regret. It meant that much and still does. After a few seasons of hunting elk close to home, and killing some good bulls, I yearned for more….more challenge, more adventure, more of the mountain life, so I headed to eastern Oregon where I fell in love with wilderness elk hunting. I’ve always hated seeing and competing with other hunters for animals, so as a public-land, struggling to make ends meet blue-collar guy, it felt like the only edge I could gain was to go where others avoided. I couldn’t afford premium hunts and never drew any highly regarded tags but I learned that the remote setting of the wilderness offered some amazing opportunities while at the same time weeded out 99% of other hunters as it is tough hunting and tough living. It was hard for me too, but walking up a dusty pack trail in prime mountain elk country with not a single boot track in it helped ease the pain for me and kept me focused. Backcountry hunting opened up a whole new world for me. Another thing I like about the backcountry was being “in deep” seemed like the great equalizer to me…it was one of the few places I knew of where money and status didn’t make the hunting any easier. I was a warehouse worker back home but pulling good bulls and bucks out of the mountains made me feel like I was capable of great things. As a young guy searching for direction in life the wilderness had a big impact on me. However, initially, learning the ropes in the wilderness, trying to kill an elk with my bow gave me that old familiar feeling of trying to achieve the impossible. The elk hunting in deep was intense….wild country, high-strung, wild elk on edge from living in a extremely harsh environment while trying to steer clear of the natural born killers of the mountains, cougars, were real tough to get in bow range of. And the intimidating expanse of Oregon’s largest wilderness area, as a solo hunter, shook my confidence. I wondered many times if I had what it took to get it done “in deep”? I did. To begin my wilderness elk hunting career, like my first bow kill ever, I again arrowed a “trophy” spike bull. While not one for the wall, tagging that wilderness bull gave me confidence, which I rode for many years in that same wilderness country killing quite a few decent bulls, bucks and the occasional bear. As the years clicked by and my bowhunting experience increased, the expectations I put on myself increased as well. I started off wanting to kill a bull, any bull. Then I wanted to take a branched-antlered bull, then a mature bull….then of course to everyone’s dream, a 6 x 6 monarch of the mountains. I arrowed my first 6-point in 1996, my 8th season of bowhunting elk in my home state of Oregon. Back then, there was no big out-of-state trips for me….I had a couple young boys (my baby girl Taryn was still a few years from coming into this world) at the time I’d get one week long crack at arrowing a bull each year. I was an Oregon elk hunter (exclusively) and proud of it. I worked really hard to make the most of that week. Over time things changed, my passion for writing led to more hunting opportunities. 2003, when I killed a big wilderness 5-point, was the last year I haven’t arrowed at least one 6-point or better bull. The “opportunity” I write of has led to changes I haven’t been real crazy about. Hunting on film for the Outdoor Channel means I can no longer hunt the wilderness. In all but very special circumstances, it is illegal to film professionally in designated wilderness areas as doing so is considered a “commercial activity”. This was real hard for me to stomach….the wilderness is where I believed I’ve learned life’s most valuable lessons. Also, because to film the hunt, of course you must be accompanied by a cameraman, which is something else that makes me cringe. Not to slight the skilled field producers I’ve worked with behind the camera, but to me having ANYONE there ruins a lot of what I have always loved about bowhunting –the solitude…trying to pass the TEST that is solo mountain hunting. Not to mention having two guys stalking up on game, trying to get in bow range, i.e. “the red zone”, makes something already very, very difficult, a lot harder. If I went back to hunting alone, giving up the TV work, I could again venture deep taking on the mountains and the big remote country bulls, solo. I’ve thought about it and still think about it a lot. While “professional” hunting allows me to make money, which helps support my family and passion (bowhunting addiction), and I am grateful people believe in me to get it done “on film”, it wouldn’t be that hard for me to give it up. I’ve kept my 40 hour a week 9-5 all these years for this very reason. I could easily give up the business side of hunting and go back to being just a regular bowhunter. Wouldn’t bother me a bit. I am not in love with the money, I am in love with bowhunting. Conversely, there are things I am thankful for in terms of filming my hunts….as I mentioned this past month all my adventures have been filmed for Team Elk, Rocky Mountain Elk Foundation’s TV show running on Outdoor Channel…sharing my experiences with friends, family and hundreds of thousands of bowhunters everywhere means a lot to me. This is the sweet part of the bittersweet for me. I also very much appreciate of all the new friends I’ve made while travelling. This elk season I met amazing families in Utah (Woolstenhulme) and New Mexico (Armstrong), solidified special friendships in Oregon (Ron Hofsess and Jody Cyr) and Colorado (Mike & Brenda Powell), shared camps with new partners like Adam LaRoche, Brandon Bates, Lee & Tiffany Lakosky, roamed the mountains with great guides, Ashley Woolstenhulme, Justin Adkisson, Eric Kern, and worked with new guys (to me) behind the camera, Jon Bergmann, Ken Sciacca and Ty Cary, who have me re-thinking my “cussing the cameraman” mindset. These guys made my challenging job just a bit easier and the results speak for themselves. In this regard I am also thankful we can share all of these hunts because I know firsthand how powerful elk hunting experiences can inspire others to, “dream bigger and achieve more.” I grew up watching Larry D. Jones and Dwight Schuh hunt elk on their famous tape Elk Fever…it changed my life. I appreciate this and if what we capture for Team Elk and air on Outdoor Channel gives others the motivation to chase their elk hunting dreams then all the effort and sacrifice has been worth it. I love getting emails from new hunters who’ve experienced the elk mountains for the first time and come out “wild –eyed” with excitement and overflowing with passion, hungry for more. Despite all the good people (guides, packers, friends, cameramen, etc. ), who shared their knowledge and talents in working towards a common goal (making powerful hunting TV), there was only one guy releasing the arrow…me. I take full responsibility for every arrow that leaves my bow and never shoot without being fully cognizant that what I am doing is trying to take the life of something. Over the years this act has taken on more and a deeper meaning to me, which is why I put all I have into getting 100% ready mentally and physically for hunting the mountains of the west. 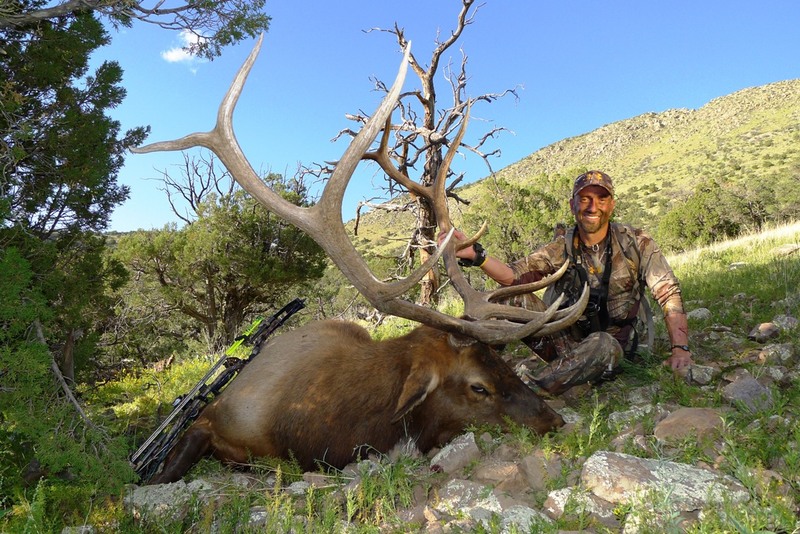 Killing a big bull, or any bull in the mountains with a bow is one of the most challenging goals anyone can set. Success rate on elk is around 10% meaning 90% of bowhunters out there fail every year. This is why when I arrowed that big bull in New Mexico the other day the feeling of accomplishment then matched exactly the feeling I had after arrowing my first bull 23 seasons ago. I’ve come along way as a hunter over this time, and killed many bulls, but achieving the impossible is a target no one ever really hits. What I did this year was special to me, but I wasn’t perfect. I passed up a shot at a big bull in Utah mistakenly thinking he was going to come closer…he didn’t. He was broadside, looking the other way and unaware. For some reason my confidence waned for a second and I thought, “Let’s just film him a bit longer, wait for him to get to 30 yards…more of a slam dunk.” He went down the hill instead of towards me and the chance was lost on the best bull I’d seen on the trip. Then, when I did kill, it took me two arrows to get my bull finished off in Utah (liver on the first one) and two arrows for my bull in Oregon (a touch forward), so I definitely have some room for improvement there. With an elk size kill zone I expect to be better and owe it to the animal to be at my very best. Also, I let a big bull in Oregon come in to 13 yards and I didn’t get him killed, which was frustrating. I am not sure what I could have done different but I’ll figuring something out….some way to improve my “crunch time” strategy, decision making and implementation. With that in mind, I’ll head out on a run today, shoot my bow this afternoon in September sun then lift tonight and in climbing that never-ending ladder I know full well I’ll never reach the top. That’s o.k., because as I wrote on my blog before season (www.cameronhanes.com) killing, while a necessary validation of my effort and sacrifice, is not what truly motivates me…I am IN LOVE WITH THE JOURNEY. To find out how I’ve filled 10 for 10 of my tags this season and haven’t missed an animal, check back here for my next article, “The Blueprint to Mountain Bowhunting”. I’ll discuss in detail my training and shooting regiment and my diet/supplement plan. Stay tuned also for my Beast Mode Bowhunting Diet and Fitness DVD. 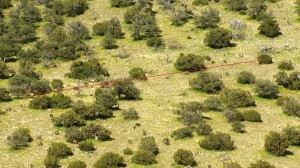 Note: I spot and stalked all the bulls I killed this year, not a peep made on a cow call or bugle to get them in range. Spot and stalking is the way I’ve killed 80% of my bulls. I simply love the challenge of weaving through a herd of elk and taking out the king of the mountain. And, every bull was broadside or quartering-away, not moving, and had no idea I was there….I think these points are key to making quick, clean, ethical kills. I knew the range, took my time and put every arrow on the mark. Tune in to Team Elk to join me on these hunts.